I provide a free one hour consultation to discuss your ideas and assess your property. 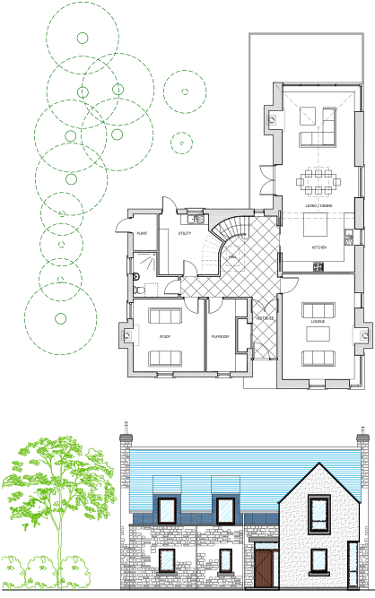 Before beginning the design I carry out a detailed site or building survey and draw up the existing plans. I would at this stage talk to you about your budget and aspirations for the project. I offer unique design solutions to each client. I work closely with you to research and understand your requirements so that I can offer you the best possible solution for your property. The process includes meetings, talking on the telephone and as much contact as you need in order to get the design and layout that you are completely satisfied with. I believe in a thoroughly researched and rigorous design process which explores all options at the outset. I have a good working relationship with Scottish Borders and other local authorities throughout Scotland. I endeavour to navigate the Planning and Building Control process within the shortest possible timescales. I would act as your agent to negotiate with the planning department to obtain the Planning Permission. At the Building Warrant stage I co-ordinate the information from the engineer and prepare detailed technical drawings and specifications. I can provide detailed drawings and specifications which can be issued to builders so that a complete and accurate price can be obtained. I can assist you in selecting the contractor by checking the prices which come back and negotiating the best price on your behalf. I can set up and administer the contract between the client and the builder. I can visit the site on a regular basis to inspect the work and will hold regular site meetings with the client to ensure that their concerns are being met. I can ensure a high quality and stress free build by issuing Architects Instructions to rectify work which has not been carried out in accordance with the contract drawings. I offer advice on interior design, space planning and design of fitted furniture. I can assist in sourcing the best materials, fittings, and furnishings for your home should you wish for my involvement at this stage in the project. I provide a follow up service, which will involve coming back after the work is complete and preparing a snagging list so that the builder can remedy any defects. I will ensure that the work is complete to satisfy building regulations standards and I will obtain the Completion Certificate from the Local Authority. I am a certified Passive House designer and I take a holistic approach to each project. I consider the services and enivronmental aspect, through the design stages and I can advise on upgrading of existing properties to enhance thermal performance. I also work with mechanical and electrical engineers when the project requires it. We strive to achieve low running and maintenance costs for each job.